Life, colour, food and music… it is easy to appreciate why Barcelona is one of the most visited cities in the world. 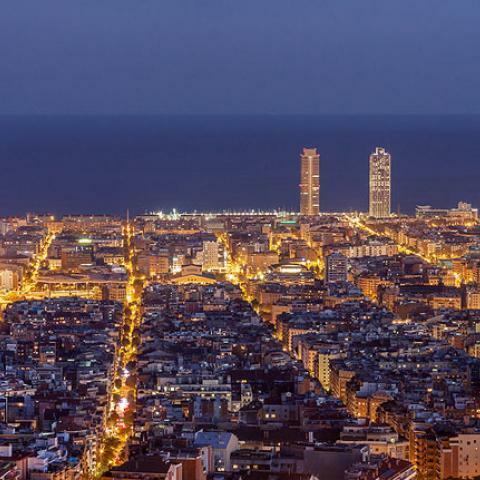 Founded in the 3rd century BC, Barcelona has a cultural heritage near impossible to replicate. Diverse styles of architecture indicate its development through the ages. Medieval castles compete with Gothic architecture, none more inspiring that Gaudi’s Gothic masterpiece, the Sagrada Familia. As the largest metropolis to sit on the Mediterranean Sea, Barcelona boasts seven beaches within easy reach of the city centre – the oldest and most popular beaches, Barceloneta, Icaria and Mar Bella, attract thousands of visitors every day. Another of the city’s most popular attractions is the tourist-laden La Rambla, a tree-lined promenade, stretching for over a kilometre, dotted with street performers, cafes, markets and pet stalls. Spaniards love food. They eat often, rarely dine alone, and typically serve dinner after 9pm.Tapas are the favoured way to eat in both traditional and modern areas of Barcelona. Made up of small plates of savoury fares, tapas are shared after work and over drinks before main meals, and come served cold, consisting of olives and cheeses, or warm, featuring morsels of chorizo, squid or crispy potatoes. Authentic Barcelonan food experiences can be enjoyed in the El Raval district. An area with a gritty past, located close to the port, El Raval buzzes with a huge variety of restaurants, bars and cafes. Close by, the city’s two most famous food markets, La Boqueria and Mercat Sant Antoni are go-tos for picnic and in-room snacks. Both markets stock fresh fruit, delicious Spanish chorizo and jamon, and other gastronomies ideal for crafting DIY tapas.&nbsp; At the other end of the spectrum, Barcelona caters to those with a penchant for high-end fine-dining, with more than 20 Michelin-starred restaurants found across the city. Barcelona’s most concentrated shopping district stretches from La Rambla through Placa de Catalunya, along Passeig de Gracia and up Avenue Diagonal. The area is pedestrian-friendly and home to numerous local and international chains. Passeig de Gracia is ranked as one of the finest shopping destinations in the world. Reminiscent of the Champs Elysses in Paris, high-end luxury designs can be found here. Similar to the Parisian street, beautiful buildings and expensive cafes line the pavement, making it a popular haunt on which to whittle away time and Euros.A fashion-conscious city, Barcelona has a healthy attitude towards individuality, valuing a relaxed approach to fashion as equally acceptable as high-maintenance couture. The funky streets and narrow alleys of El Born are great locales for those looking to find something unique. Cozy cafés, art galleries and boutiques present a wonderful way to experience the city's beat. For visitors whose preference is to source everything under one roof, Spanish department stores El Cort Ingles and Fnac are must-shop destinations. So, you think you know Barcelona – the beach, Gaudi and cerveza – right? Look beyond the city’s inimitable façade and you may be surprised to find a place on the cutting edge.